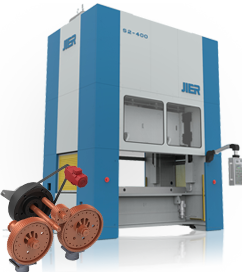 The JIER Group was established in 1937 as a heavy machinery manufacturer and has been designing and manufacturing stamping press technology since 1955. JIER North American is a wholly owned subsidiary of the JIER Machine-Tool Group Co., Ltd., of Jinan, China. The JIER Group was established in 1937 as a heavy machinery manufacturer and has been designing and manufacturing stamping press technology since 1955. Our customer base includes domestic and foreign automotive OEM’s, Tiered automotive suppliers, and other OEM’s requiring heavy duty machine technology. JIER machinery and equipment support the automotive, appliance, rail, aerospace, shipbuilding, and machinery industries, among many others.